Thanks a lot for all your comments about the braces. It's really better than I thought. There's a saying here that says that you can get used to everything except starve... so now I'm used to them and there's no pain anymore... I just make a lot of weird faces with them :P And yes, I got to pick the color of the rubber bands (light blue!)... I'll get to change them every month! Love your little dollies. I had braces back when I was 13 years old...many, many moons ago. I remember the first time I got them on, my entire mouth throbbed! And what do you think my mother made for dinner that night, tacos de pollo!! I cried!! LOL The braces now are so much more efficient and colourful. I had full bands on everyone of my friggin' teeth...yuck. Anyway, 47 years later, I still have gorgeous teeth. 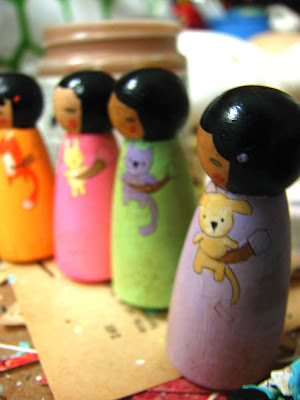 Those little wooden dolls are so cute. I love how they are holding little snugglies. Oh, these little dolls are wonderful :]. I am glad you are getting used to the braces. I love the colors and the running theme...fantastic! Your art is so breath taking , I love it!! Your dolls are the cutest!